With its playful exploration of disorientation, The North, which premiered at the Tramway last weekend, opens up many possibilities for further inventive developments. 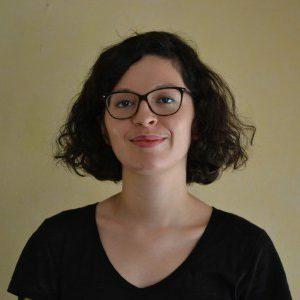 Everyone, Joan Clevillé argues, has some concept of the North. It is an ever-fleeting space, as the limit of the North can always be pushed back, but one that brings to mind a wealth of references, images, and ideas, which this production draws on. As much as the North, though, I find myself thinking about Lewis Carrol’s zany Wonderland – and after all, Alice’s fall down the rabbit hole rather calls to mind the idea of South. Indeed, rather than a cardinal direction or a map to follow the meanderings of its performers, The North leaves its spectators with the feeling of witnessing a scene whose secret they are never quite in on. 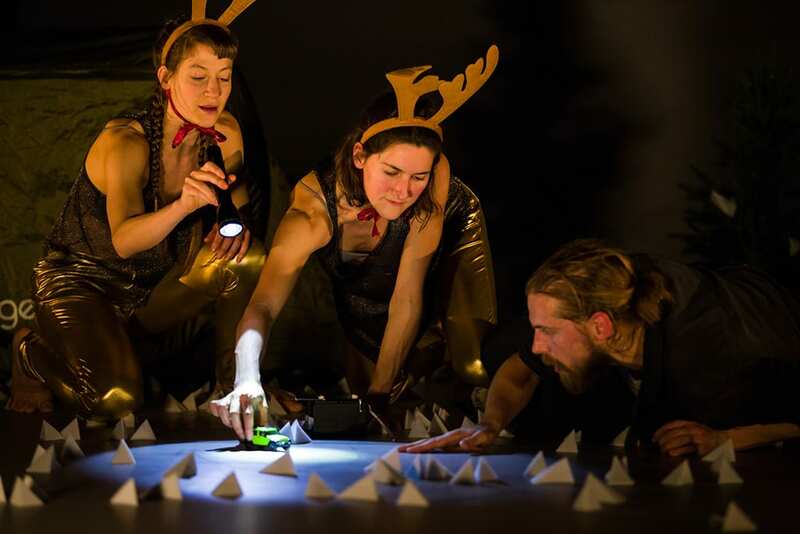 Neither is the protagonist of the piece, John (interpreted by Kendall), magically transported to the North by two shape-shifting, antler-wearing creatures – Eve Ganneau and Solène Weichnachter – dressed in matching Christmas jumpers and golden trousers. In the first minutes that follow his arrival in the new place (where he is carried to in a plastic bag), John is taken on a forced adventure to the sound of Wagner’s ‘Ride of the Valkyries’. His hosts are alternatively bleating, howling, quacking and meowing, and he can’t even remember his name. The performance sees John pushed to the limits of his sanity, and ultimately, of his humanity. While The North contains some hilarious passages – including a quacking dialogue between the protagonist and one of the elves, angels, or maybe demons who seem to follow him around – other have an eerier, more worrying quality. In a strange duet, we see Ganneau and Weichnachter morphing into one creature under the cover of a single black raincoat. The North suggests a myriad of images, metamorphoses, and possibilities with minimal material and an inventive choreography. 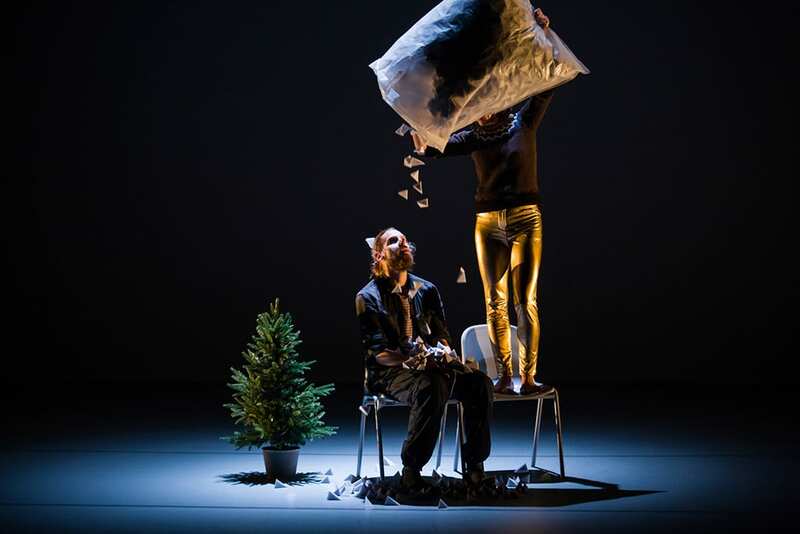 In keeping with this principle, the minimal set does nothing to assuage our feeling of physical disorientation: a tiny fir tree occupies the centre of the stage in lieu of a forest, the snow is a bag full of tiny pieces of paper folded into origami snowflakes, which John kicks and throws around. The North is rather bare – and bleak. Everything, floor and sky, is white. Against the immaculate screen at the back of the stage, shadows take on nightmarish proportions, and light proves changeable and elusive. The North outlines a world that is both wonderful and fraught with haunting images and night terrors. John’s travel to the North leaves him – and us – puzzled and transformed.